Artist Joseph Klibansky and blowUp media exhibit a 700 m² artwork of Klibansky's "Big Bang" on the side of the "Gershwin Bothers" building along the Zuidas Amsterdam. 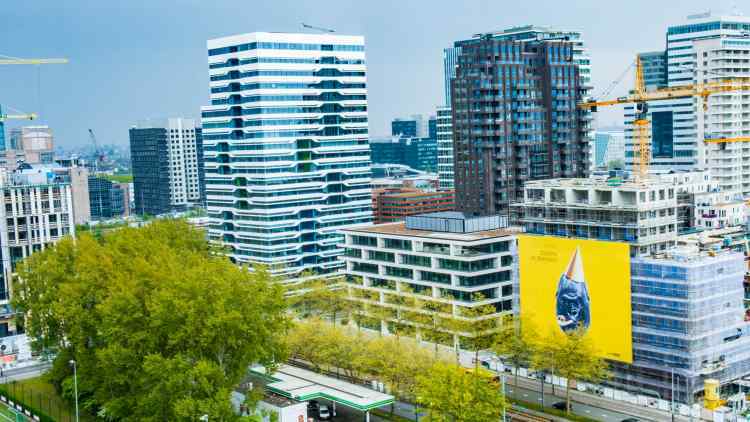 Launching this week a 700 m² Giant Artwork created by the Dutch contemporary artist Joseph Klibansky (32) will cover one of the “Gershwin Brothers” buildings that is currently being developed on the Zuidas Amsterdam, a very exclusive district of Amsterdam with international character. The artwork will improve the look and feel of the neighbourhood during the reconstruction phase of the building for at least six weeks. The art project has the full support of the city of Amsterdam. “There is lot going on along the Zuidas Amsterdam at the moment as many businesses are investing in this area. We highly appreciated that these investments stimulate growth of the area. But with growth comes structural changes and bigger construction projects that affect the cityscape and consequently the people living and working in this area. We think that Joseph Klibansky’s giant piece of art really contributes to the quality of the public space along the Zuidas Amsterdam during the current times of change”, the city of Amsterdam.